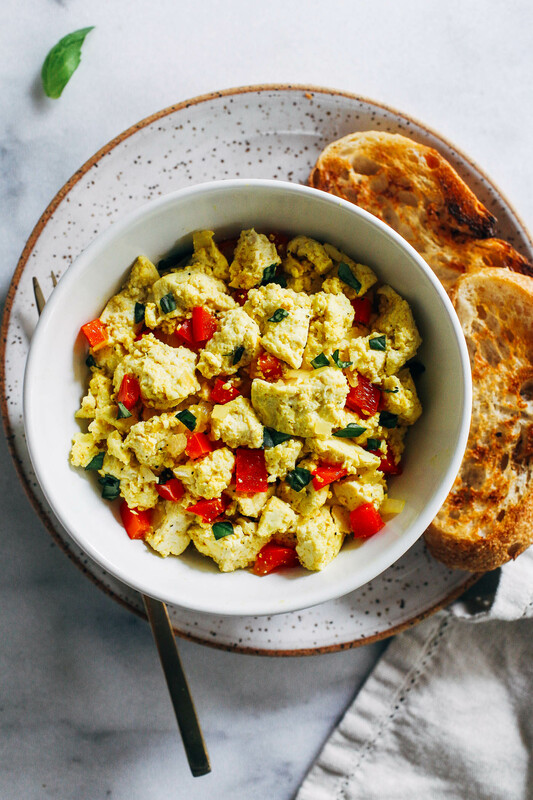 Easy Tofu Scramble- a healthy plant-based alternative to scrambled eggs that’s packed full of flavor and protein. Just 8 ingredients to make! If you would have told me a few years ago that I would rather eat a tofu scramble than one made with eggs I would have looked at you like you were nuts. Why on earth would I want to eat all of that soy for breakfast?! Ick. Well friends, times have changed. I don’t look at soy the way that I used to. I don’t always eat it at every meal and sometimes not every day, but certainly more than I did before. This is because I found that some of the research that claimed the phytoestrogens were linked to cancer is simply not true. In fact, soy consumption has actually been shown to reduce cancer risk. You might have noticed this already but my views on eating animals products have also changed in the last several months. I haven’t shared any recipes with eggs or dairy in while because we’ve recently transitioned to a plant-based lifestyle and eliminated them from our diet. I’ve learned so much about the effects that animal agriculture has on our health, the planet and the animals that, simply put, I’ve lost my appetite for it. I know to the average person that might sound restrictive but I don’t see it like that. I believe the only thing that makes plant-based eating restrictive is our culture. As human beings we are programmed to think that we need animal protein to survive and while I won’t get into that very long debate on my blog, I will say that there are plenty of people out there to prove that this is not the case. It’s not only possible to survive on a plant-based diet but to thrive. I’ve personally never felt better eating this way, both physically and emotionally. 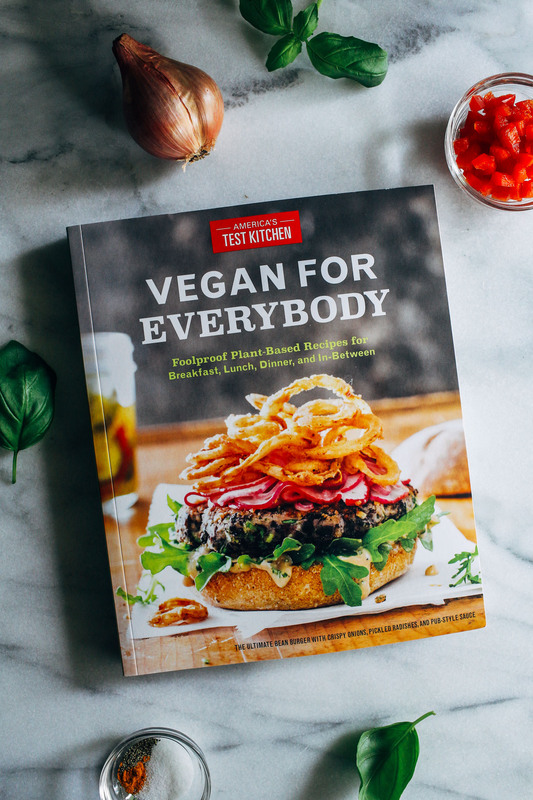 Naturally when America’s Test Kitchen asked if they could send me a copy of their newest book Vegan For Everybody, I jumped at the opportunity. 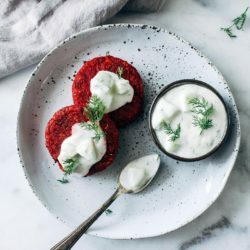 If you’re not familiar with ATK, they’re known for taking the time to research multiple different methods of preparation and execution to assure that they’re producing the best recipes possible. 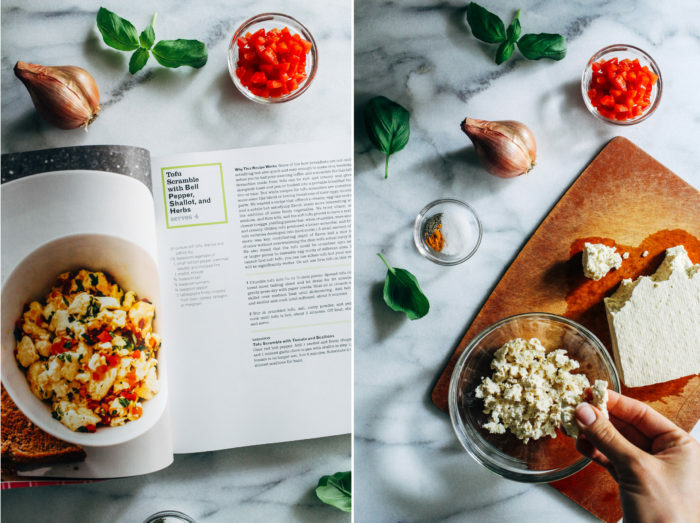 All of their books are loaded with delicious fool-proof recipes and tips to help make you an expert in that style of cuisine. 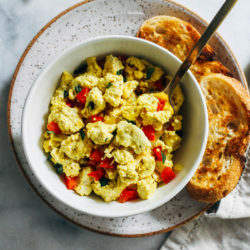 I’ve had many a tofu scrambles out to eat but I never tried making my own at home so I thought their recipe would be the perfect place to start. It calls for just a few simple ingredients and takes less than 10 minutes to whip up. My kinda breakfast. The trick to getting an egg-like texture is to use soft tofu and to crumble it into large pieces that range from 1/4 to 1/2-inch in size then let it dry out on a baking sheet lined with a dish towel. I actually wasn’t able to find soft tofu so I had to use firm but it still turned out amazing. 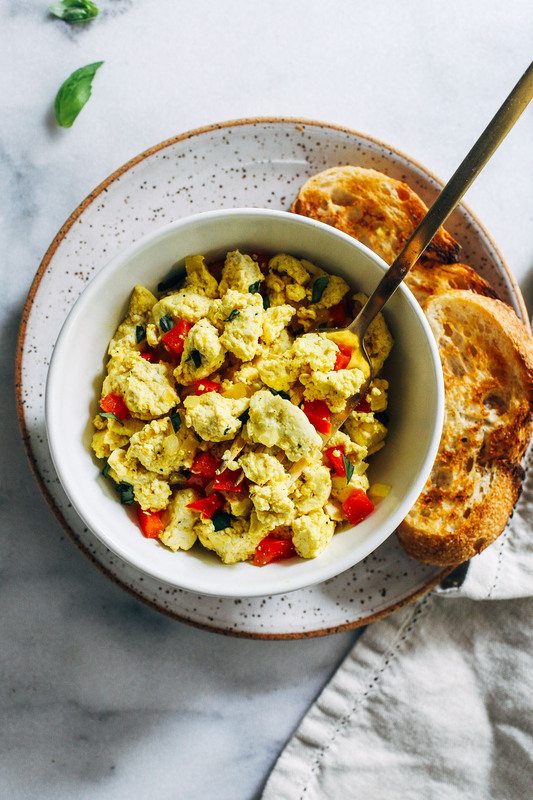 The shallot, red pepper, basil and salt add just the right amount flavor while the turmeric gives it a light yellow color that resembles scrambled eggs. 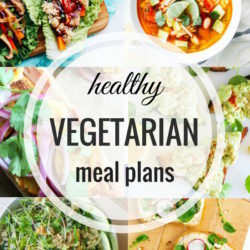 Whether you’re vegan, vegetarian or an omnivore who’s interested in eating more plant-based meals, I highly recommend checking out Vegan For Everybody. It’s an awesome book and proves that you don’t need animal products to cook drool-worthy meals that will please every palate! 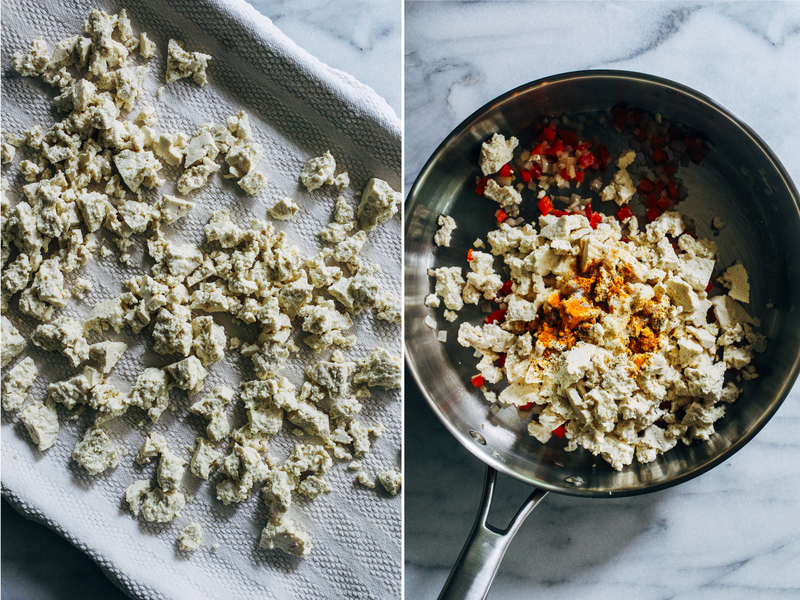 Cover a baking sheet with paper towels (or a tea towel) then crumble the tofu into 1/4- to 1/2-inch pieces on top. Let drain for 20 minutes, then gently press with paper towels. In a large skillet, warm the oil over medium heat. Add the bell pepper and shallot and cook until softened, about 5 minutes. Stir in crumbled tofu with salt, turmeric, and pepper. Cook until tofu is hot, about 3-5 minutes. Remove from heat, add fresh basil then serve warm. *If you can’t find soft tofu, firm tofu (not super firm) will also work just be careful not to crumble it too finely. 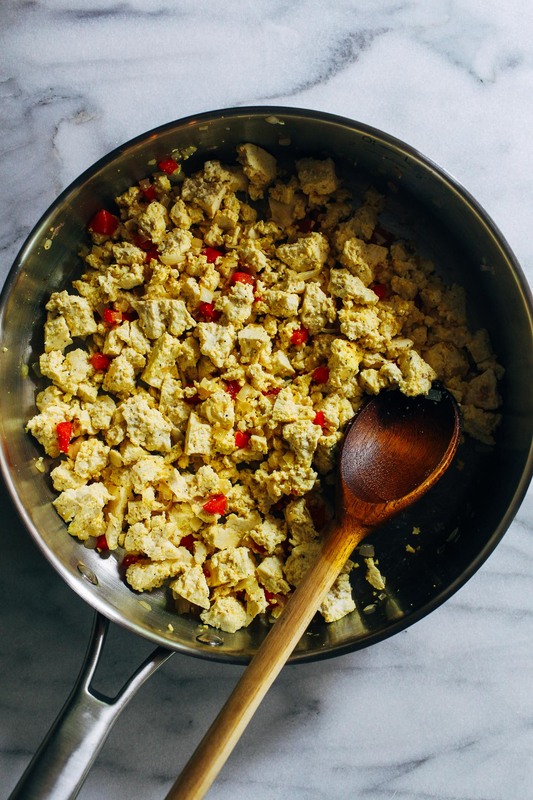 You know I love eggs, BUT BUT I also love tofu scramble. SO filling and so versatile. Also, YES team soy! I was into tofu scrambles for a while but my doctors recommended I not add tofu to my diet while I was having fertility issues. According to the article you referenced it still sounds like eating eggs would be a better choice since they are a whole food and tofu is a processed food. Maybe in a year David and I will start raising our own chickens. So many of our friends are doing it and it seems worth it. Also two of our neighbors have chickens. I wish they’d share their eggs with us. I’d do it this year but I don’t want to take on any new responsibilities while being pregnant. haha. That’s true, the article does mention that tofu is processed but the point is that soy isn’t harmful to your health as many might assume from misleading media. Doctors are especially confused about what to recommend for their patients; they receive less than 8 hours of nutrition education during their entire career! It’s funny because you always hear about how bad GMO soy, corn and wheat are for us (which they are) but those crops are mainly grown to feed the animals. So unless you are buying pastured-raised, certified organic animal products then you are still consuming the soy and grain second hand. Even then, many of these animals have been genetically bred to be the most profitable (grow larger faster, constantly produce milk, etc) so they are often in poor health. Meat, eggs and dairy are also loaded with mammal estrogens and toxins (like PCBs) which greatly influence our hormones. I know you do a good job paying attention to where your food comes from and eating a balanced diet. While I personally have no interest in consuming animals I think the safest bet is to buy only from local farmers and chat with them about where they source their animals from, what they’re fed, and how their living conditions are. It’s sad that we have to put so much work in as a consumer but the industry only cares about profit, not our health nor the health of the animals or the planet. 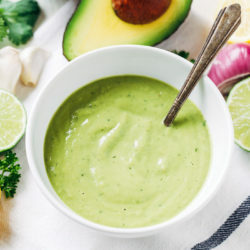 Eating adequate fiber is also crucial because it regulates blood sugar which helps balance your hormones and eliminate excess estrogens and toxins. I agree that most doctors don’t know enough about nutrition to be giving advice. It’s really sad. Luckily I see a naturopathic doctor who is very educated in nutrition. As well as a acupuncturist who receives tons of education in nutrition. I trust their knowledge probably more than anyone, but as you mentioned, you have to do your best to educate yourself. I also believe that everyone’s bodies work differently. So for someone who thrives on a vegetarian/vegan diet like yourself it wouldn’t be the same for someone like me. I’ve tried tons of different diets (including vegetarian) and I seem to feel best and have the least health issues on a mostly non-processed whole foods (including meat and fish) diet. Nutrition is highly personalize is what I’ve realized. I think it’s awesome that you’ve found health care professionals that you can trust! And I agree that everyone responds differently to certain ways of eating. I tried eating vegan for a week a few years ago and was bloated and uncomfortable. But then I realized that if I drank more water and walked/exercised more, it helped my digestion significantly. So some of it is the individual and some of it is also understanding how to help your body adapt to a new diet. I love scrambled eggs and I love putting veggies in them. Riley calls them “salad eggs,” which I have no problem with. That book looks awesome too! 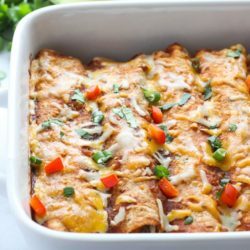 I love the idea of finding vegan recipes that don’t include fake meat. That’s honestly been one of the biggest turn-offs to plant-based diets for me. For years, my sister was vegan and would always try to get me to try faux meats that tasted “just like” whatever and I’ve never liked any of them. 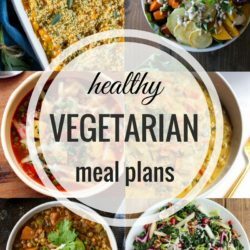 I think I could incorporate a lot more vegan meals if I just embraced the ingredients as they are, instead of trying to turn them into some kind of imitation of a meat/cheese/etc. I think that’s why I like your recipes so much, because you highlight ingredients as they are instead of trying to disguise them as something else, if that makes sense. I feel the same way about the fake meats. They are great for when you first transition away from eating meat but long-term they are not the healthiest choice. Eating whole foods is definitely the way to go! It’s really sad that it’s gotten a bad reputation. There is so much research out there that proves it is a healthy option. There is also research to confuse people which is often funded by certain industries that don’t want competition. It’s very important to pay attention to where the research is published, whether or not it’s peer reviewed and who is funding it. Hooray! Sarah…. Love this tofu scramble. Just gorgeous! I started making tofu breakfasts last year when my cousin introduced them to me.. They are quick and easy to whip up. While I do still eat eggs (from the free range, organic small family farm down the street), when those hens aren’t layin, I’m doing tofu scrambles. I LOVE tofu, but have to eat it in moderation due to a sensitivity. I aim for no more than once a week – sprouted organic. It is incredibly versatile and has such a fabulous texture, taking on any flavor I throw at it! It is a big part of my diet and recipe repertoire. I’ll have to check out Vegan for Everybody… I know it’s another excellent work from ATK! Beautiful share, discussion and work. Yes, you would love ATK’s book! It’s full of helpful tips and tricks!! So happy to hear you’re thriving. I agree that there is SO much misinformation about soy – so many people think it’s the devil, but don’t realize that most of it is feeding their food. Education is key! Yes! It cracks me up that people think soy is so bad yet they are willing to eat sick animals that have been fed GMO soy their entire life. Makes perfect sense! Sarah- I am so glad you brought up the toppic of Soy. I am so on the fence about it becuase one day i’ll read its bad and harmful and then the next day I read its healthful. Truth is though that I do really enjoy tofu and decided that eating it, organic and in moderation, is most likely ok. At the very least its good for my mind and soul knowing im not restricted from something I truly enjoy. This scramble that you made looks phoenominal, your pictures are absolutely stunning. Love the recipe. I’ve been making and modifying since posted. Now I use firm tofu, found I don’t really need to drain which let me skip the oil while it cooked. I add nutritional yeast and just recently add “black salt” (https://en.m.wikipedia.org/wiki/Kala_namak)…wow!